About Us - Specialty Fence Wholesale Inc. 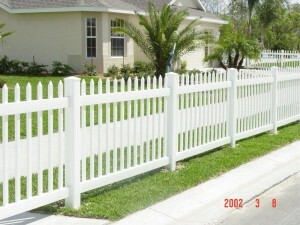 Specialty Fence Wholesale is a wholesale only company serving Florida and other areas of the southeast United States. We are a fabricator of vinyl fencing and also a distributor of aluminum fencing. SFW operates from a four-acre parcel at 180 Kid Ellis Road in Mulberry, Florida. The new 16,000 square foot facility was built by SFW to our own specifications in February 2006. The new larger facility allows us to serve our growing business and customer base. We currently employ seven employees, who work very hard to ensure all orders are delivered accurately and on time. We are dedicated to building a long-term relationship with customers by supplying quality products, reliable on time delivery and excellent customer service. Every fence is made to order using your specifications and dimensions. Al Robinson, president and owner of SFW started the company in January 2001. Al was born in Edinburgh, Scotland and raised in Southern Ontario. He began his fencing career in 1987 as an employee of Bufftech in Buffalo, NY. In 1997 he relocated to Lakeland, FL to start up Bufftechs™ distribution center. Al founded SFW to fill a growing need for Vinyl Fencing in the Central Florida area and has now expanded to include Aluminum Fencing. He has over 26 years experience in the Vinyl Fence business. Steve is a Jacksonville native. He began his career in the fence industry in 1991 with Southeastern Wire. Through the years Steve has worked in sales and management in wholesale fence distribution, PVC fabrication, and fence retail. In early 2013 Steve partnered with Al Robinson, owner of Specialty Fence Wholesale in Mulberry, Fl. to form Specialty Fence Wholesale – Jacksonville. The mission of SFW-JAX is to provide area fence contractors with quality PVC and aluminum fence systems as well as deliver outstanding customer service.